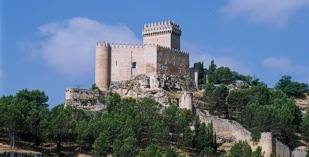 This fortress, now the Parador of Alarcon, is located on a promontory looking down over the fertile plain of the river Jucar. Steeped in history, this medieval castle has seen many sieges and revolts. It was founded by the Muslims in the 8th century and was then captured by King Alfonso VIII in the 12th century. It has been home to the Marquises de Villena and later, the home of the famous writer Don Juan Manuel. From the battlements, the keep and the main tower "Torre del Homenaje" there is an interesting view of the triple defensive walls echoing back to the past. However, the main defence of the castle was its location. It was protected from assault because it is perched on the edge of a ravine with the river Jucar forming a natural moat on three sides as it flows down the ravine. Reopened to the public in 2003 after months of work, emphasis has been placed on the austerity of the building which is in keeping with its great history. A military theme is reflected in the decor and rich Castillian wood combined with a mix of modern and classic have transformed this Parador. You will also see fine examples of the works of painters such as Tapies, Redondela, Sempere, Amadeo Gabino, Alvaro Delgado, Martinez Novillo and Menchu Gal decorating the walls of this Parador, once the home of the Marquis de Villena. 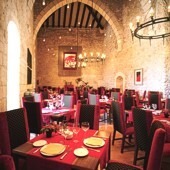 The Parador group serves regional dishes in their restaurants and have a gluten free menu. The Parador de Alarcon is on the boundary of the La Mancha and Levante regions and the local dishes are based on the meat of the young lambs and goats of the herders and the game shot by the local hunters. Another regional speciality are the sweet almond sauces (suspiros) for which the Alarcon and Alaju regions are famous. Excursions can be made to the Embalse de Alarcon, Belmonte and Ciudad Encantada. Another interesting visit is to the Cassasimarro craftsmen who specialize in handmade guitars, lutes and bandurrias. The Parador Alarcon has four twin bedded rooms and ten double bedrooms. All have private bathroom, television and telephone. The Alarcon Parador is air conditioned, has heating, lift, restaurant (Gastrobar), bar, currency exchange, parking facilities (without security and limited places), garden and conference facilities. Distance from the nearest airport is approximately 132 kms, train station is 86 kms away and the nearest port is 175 kms away. Spectacular property and managed by efficient, friendley and knowledgeable staff. Front desk staff made a special effort to help us celebrate an important occassion and we were surprised and moved. The rooms are very well appointed and maintained but you still feel like you are living in a historc property. The villiage is a little strange because it is largely deserted during the week due to absentee owners but there is a good restaurant called the "Cantina" with romantic views and excellent innovative food. We used the Parador restaurant only for breakfast, which was excellent. The experience of staying here was perfect. I very highly recommend it for anyone - it can even accomodate the disabled. My wife and I wish we were back there today! Only thing I would add is some personnel assistance with luggage to be available if needed because the parking is at some remove from the entrance. Stayed at the Parador Alarcon overnight in October when driving from Seville to Barcelona. Wonderful setting, beautifully set up and appointed rooms with quite magical views. Excellent reception and staff and a wonderful dinner that night in the restaurant....excellent food and wine and lovely friendly service. Really enjoyed our stay...probably the best of the three Paradors we stayed in on our Spanish holiday. Highly recommended. Our family's stay at the Parador Alarcon was one of the highlights of our trip to Spain. My children's (six and four) joy at staying in a real castle was matched only by my own! We splurged a bit for a nicer room - and were blown away when it turned out we'd stay in the top floor with access to the ramparts and the roof of the castle. The room was beautiful and luxuriously appointed and the access to the unbelievable views from all around the top of the castle made our stay rather magical! I should also stay that we liked it enough to extend our stay to a second night. The same room wasn't available so we "downgraded" to a standard room. This wa also beautiful and while less roomy, still felt luxurious and had a beautiful view. Though the service in the dining room was unfriendly and slow, breakfast there was fantastic. I highly recommend staying at Alarcon! What else can be said about this one? Its awesome, stunning architecture (and history) sticks out well above all other Paradores we know, quite a few by the way. Great service (very friendly, diligent and helpful at all times) and very good food, absolutely noting to complain about. By comparison, the restaurant in the hotel across the street has beautiful settings but their service is a mess, very unprofessional and unable to cater to more than 3 tables at the time. Surroundings are beautiful and impacting, but a bit lonesome, in the middle of nowhere, but if this is what you look for... In any case it is worth a (long) detour to experience this marvel. Don't miss it! 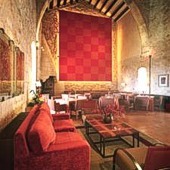 A perfectly preserved eighth century Arab castle in Alarcon is now a Parador hotel.